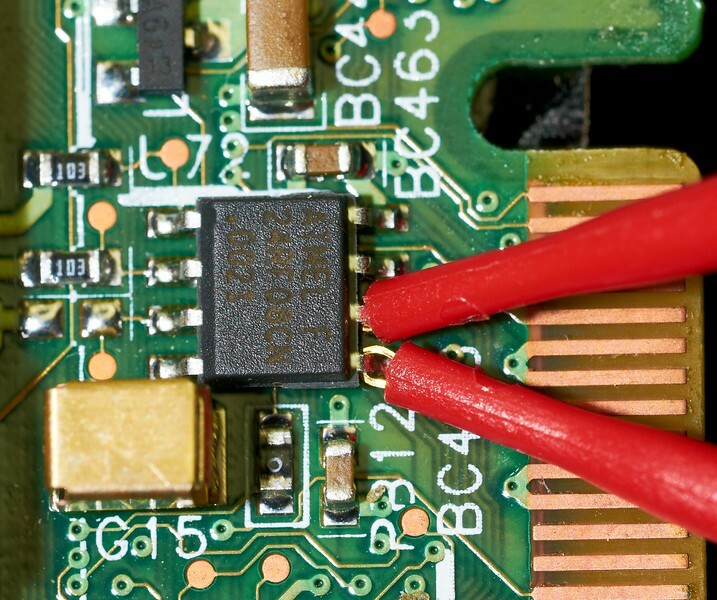 There is virtually an unlimited number of different ways in which leads can be made up for your EEPROM connections. Below are some suggestions to get you started. 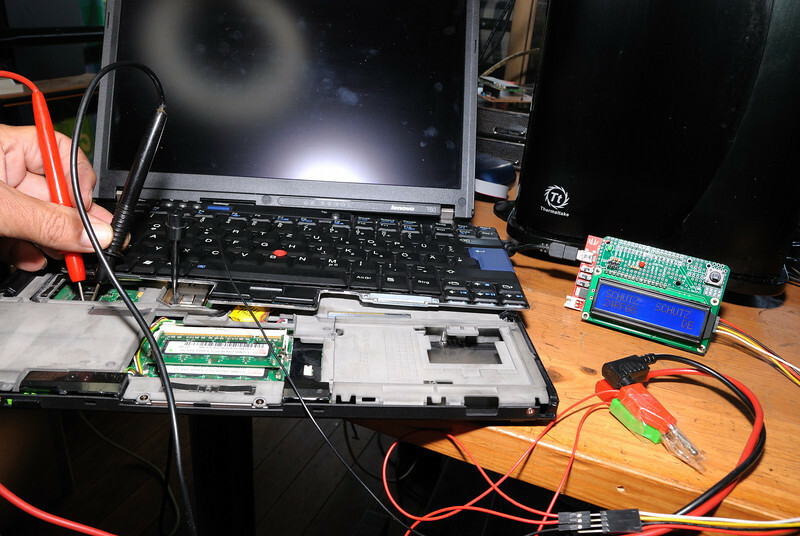 KeyMaker 9 USB is shipped with a 4 way lead, the KeyMaker 9 PCB and a small bag of parts. 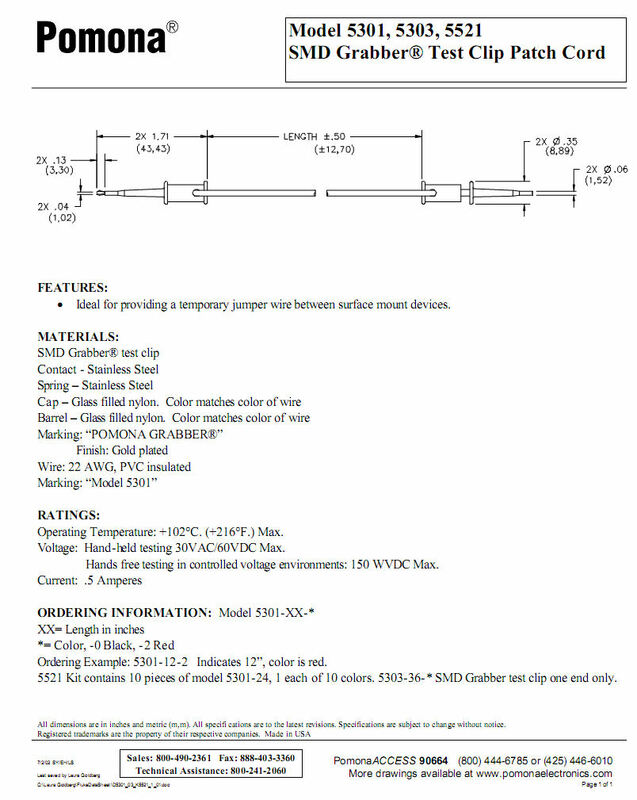 Your 4 way lead may be different to the one shown below, it changes over time from my suppliers. 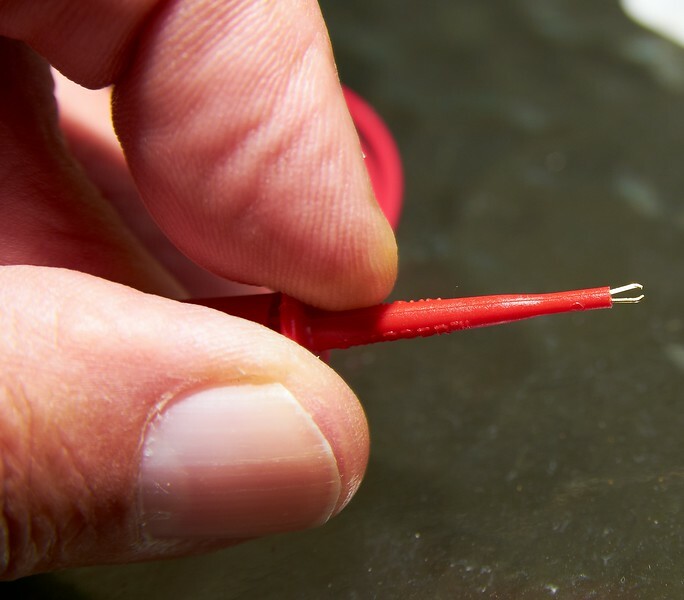 The 6 pin snap header and the fine red enamel coated wire are the only things most people will ever use. 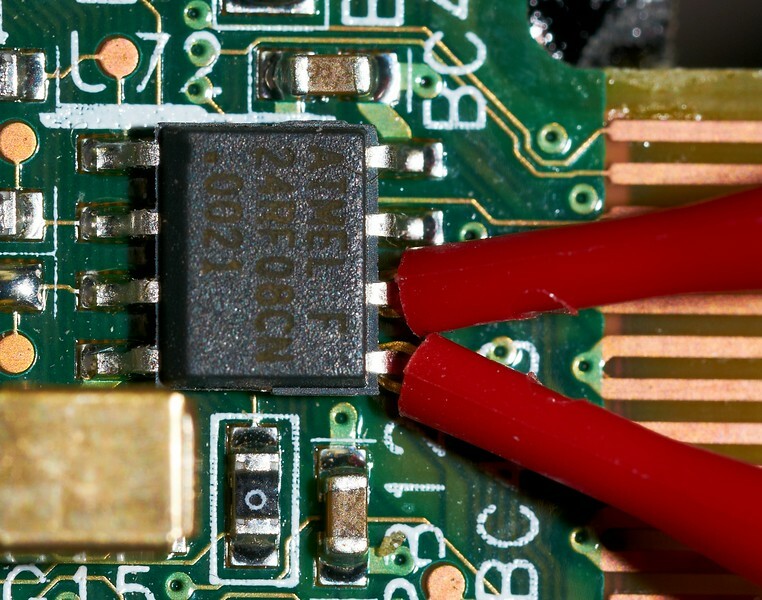 The fine red wire is useful if you prefer to make soldered connections to EEPROMS. 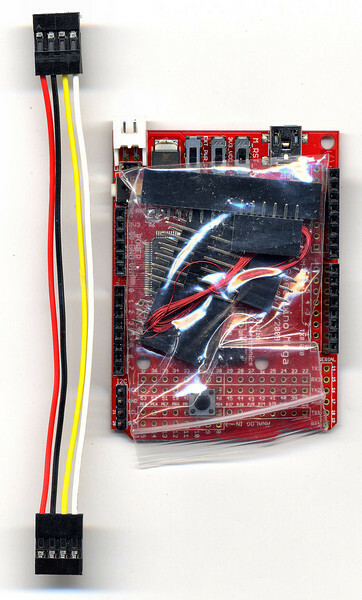 The other sockets in the plastic bag above are shipped simply because they already come with the Seeduino Mega board which the KeyMaker 9 is based on, the extra connectors can be used to populate the Mega board if after you are done with TP unlocking you decide to revert the Mega board back to full Arduino functionality. 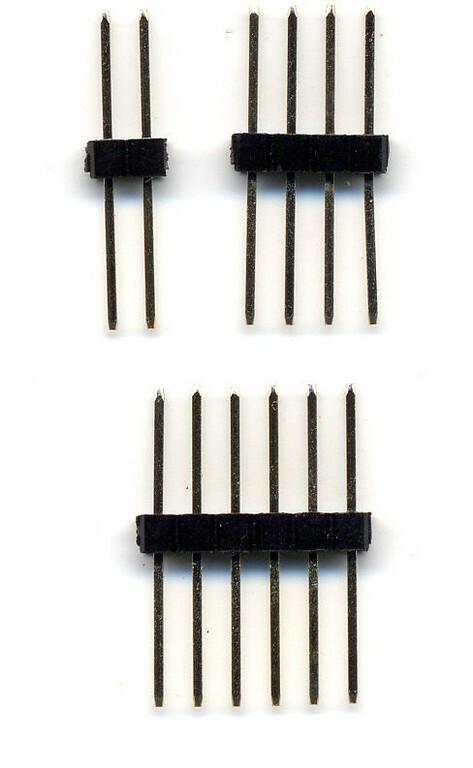 The 6 pin header has snap points, break it so you have a 2 pin header and a 4 pin header. 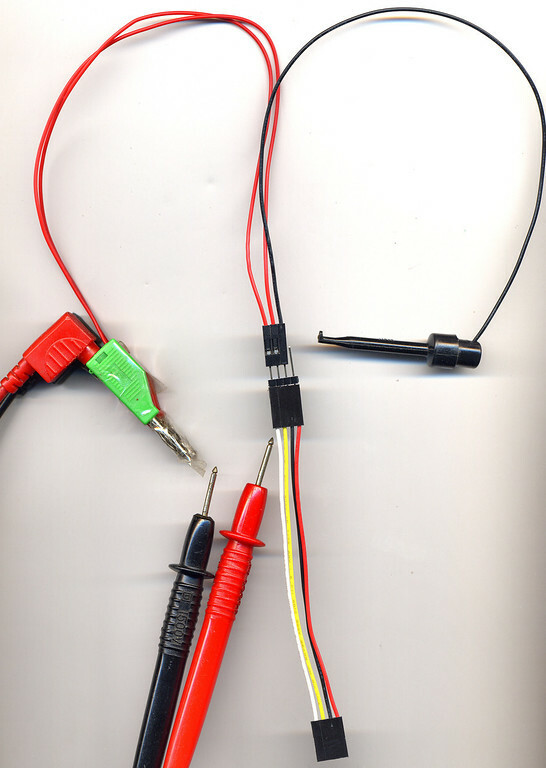 You can simply cut the wires at one end of the 4 way cable, strip the insulation back a bit and do the same with other leads you wish to connect to it, twist the wires together and use some tape for insulation, I would solder the connections of the cut wires for long term reliability. OR you can do it without cutting, you can use the header pins to join female leads to female leads as I have done. 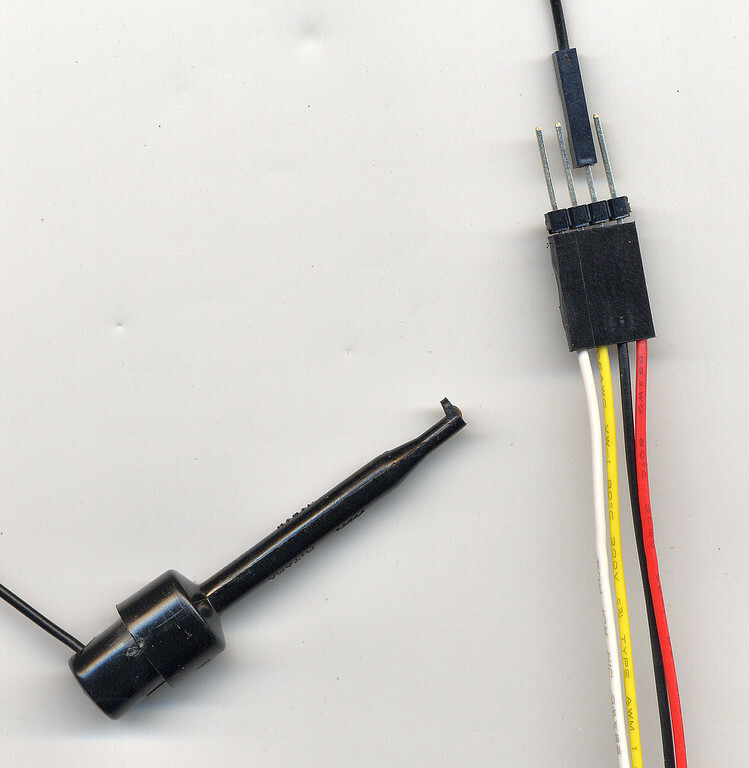 I made up my ground lead using a cable with a single female socket at each end, I cut one end off and soldered on a larger clip. Above I used some banana plugs that can be piggy backed onto plus have a hole for a separate lead to be soldered, that way I could use ordinary multi-meter probes with a sharp point, I cut the end of a short cable with single female headers at each end and used that ONLY so I would not have to cut the leads, ordinary clear sticky tape used to insulate the bare banana plug ends. 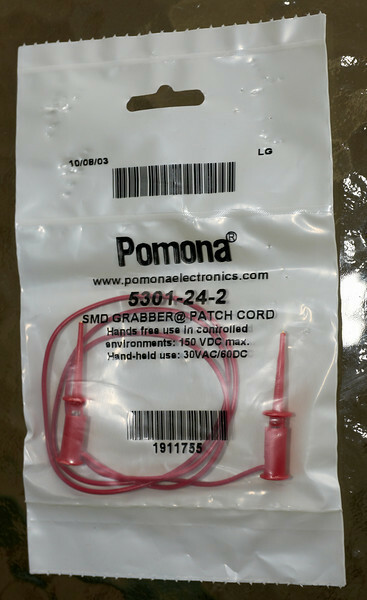 The Pomona SMD Grabber Test Clip Patch Cord is ideal for clipping your SDA and SCL leads to EEPROM pins. 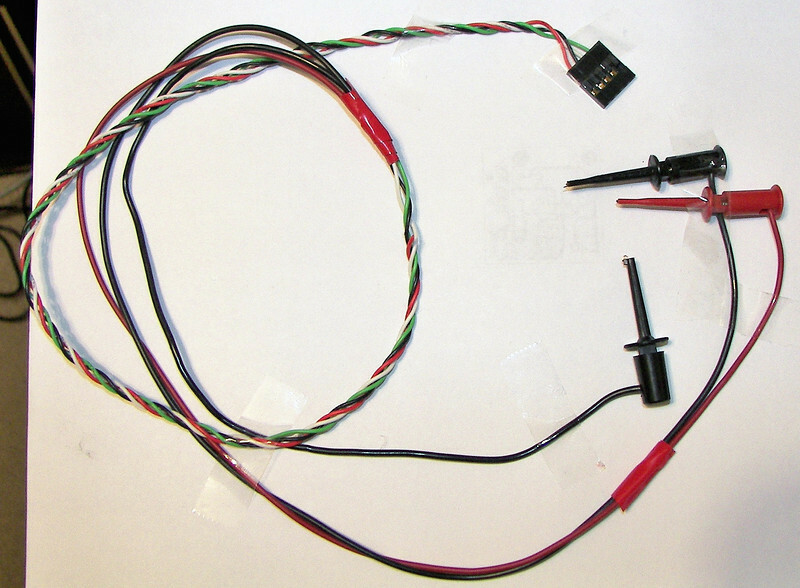 You only need one test lead, cut the cable in half and use one half for SDA and the other half for SCL, you should attach a label near the end so you don't confuse the 2 leads. You can find the Pomona leads easily by searching on the net. 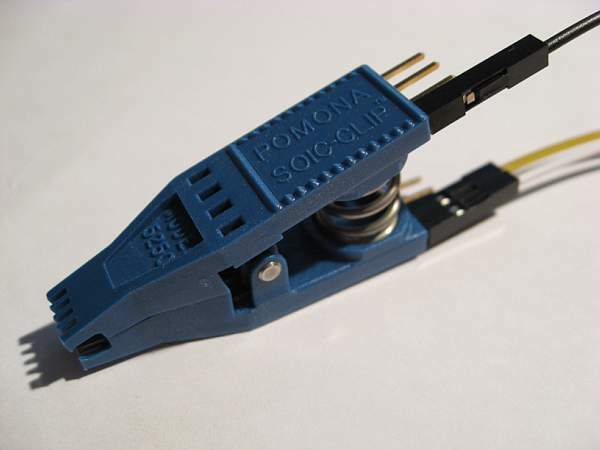 Pomona clips applied to an 8 pin 24Rf08. NOTE: You will need very good lighting and a magnifying glass to attach these, these are large macro photos, the actual 24RF08 and its pins are very small. 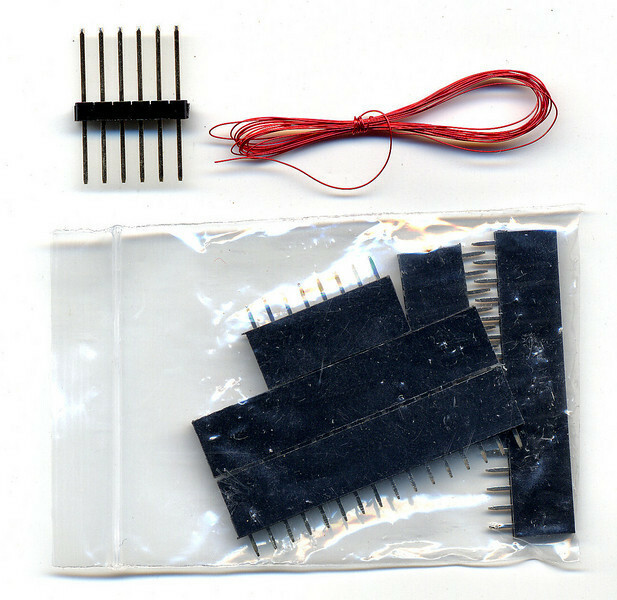 STRAIN RELIEF - you can easily apply sufficient force to damage the 24RF08 pins with these clips, take care. 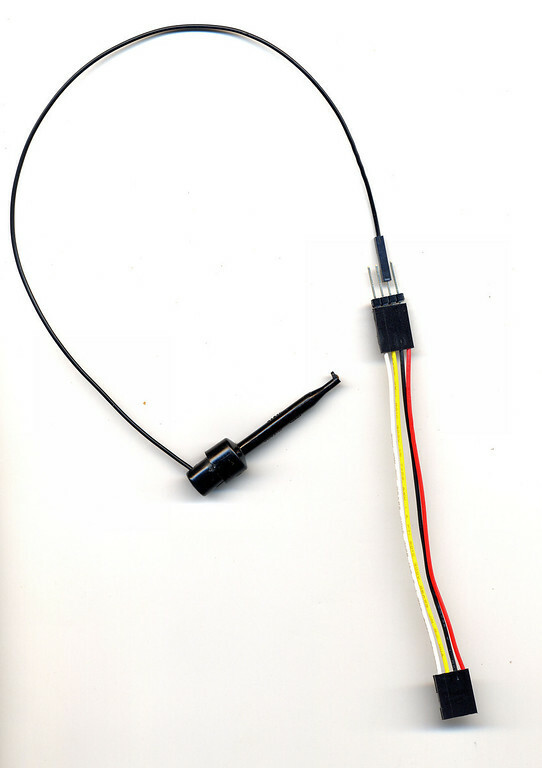 To avoid damage, make sure you place no strain to the pins by using adhesive tape to tape the cable a short distance from the pins so that any pulling on the other end of the cable does not translate to strain on the 24RF08 pins. These clips can also be used with the 14 pin 24F08 which has even more delicate pins, so the strain relief and care is even MORE IMPORTANT.